Trevi Fountain- Everything You've Wanted to Know | Travel? Yes Please! A dramatic Baroque masterpiece, Rome’s Trevi fountain is considered to be the most famous fountain in the world. Each year, 7-10 million tourists make their way to Rome. One look at the crowds surrounding the fountain day and night, and it’s fair to assume most travellers to Rome make a visit to the iconic Trevi Fountain. It’s easy to see that Trevi Fountain is gorgeous, a work of art. However, it’s much more than just a pretty fountain. Trevi Fountain has a lot of interesting iconography and there’s a good story surrounding its construction too. History- How Did Trevi Fountain Get Its Name? Trevi fountain was not always as spectacular as it is now. In 1629, Pope Urban VIII was unimpressed with the earlier version of the fountain, claiming it lacked drama. The Pope asked prominent architect and artist, Gian Lorenzo Bernini to design possible renovations for the fountain. The renovations were never completed though, as the project was abandoned when Pope Urban died. Fast forward to 1730 and Pope Clement XII would be organizing a contest, one with an amazing prize. The winner of this contest would be commissioned to redesign Trevi Fountain. The original winner was Alessandro Galilei, but Romans were outraged that a Florentine had been chosen. To silence the outcry, the second place contestant, Nicola Salvi, was awarded the commission. Salvi soon began designing the new fountain around the theme “Taming of the Waters”. Construction began in 1732, with Palazzo Poli serving as a backdrop. The fountain’s facade and sea reef were made from travertine, a form of limestone deposited by mineral springs. The statues were carved from Carrara marble. Unfortunately Salvi would not live to see completion of his masterpiece. After his death in 1751, Giuseppe Pannini took charge of the project, completing the fountain in 1762. The finished fountain would be the largest Baroque fountain in the city- 26.3 metres high and 49.15 metres wide. 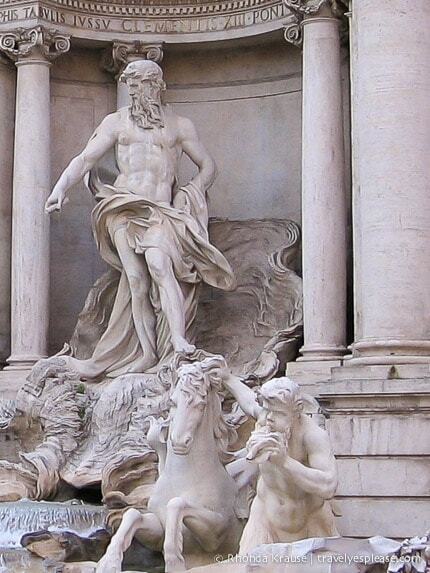 Trevi fountain, like all great pieces of art, tells a story. The statues and reliefs incorporated into the fountain are allegorical, each symbolizing and conveying a specific concept. In the centre of the fountain is a statue of Oceanus, standing under a triumphal arch. His chariot is being pulled by two sea horses, one wild and one docile, representing the opposing moods of the sea. Two Tritons are leading the horses, the older Triton holding a twisted shell to announce their passage. Left of the arch is the statue of Abundance. She is holding a horn of plenty and at her feet lies a toppled vase. The relief above her illustrates Agrippa commanding his generals to build the aqueduct. The statue of Health stands right of the arch. She is crowned with a wreath of laurel and holds a cup from which a snake drinks. The relief above her shows a Virgin lady indicating to soldiers the source of water. Statues of Abundance on the left and Health on the right. Coin Throwing in Trevi Fountain- Why and What Happens to the Money? When I travel, I like to do all the fun little rituals that promise everything from good luck to falling in love. So like custom dictates, I turned my back to the water and using my right hand, tossed a coin over my left shoulder. There…now I guaranteed my return to Rome! Legend holds, that if you toss in a second coin you’ll fall in love with an Italian. I’ve even heard that throwing in three coins means you will marry an Italian. With all that coin tossing, there is a lot of money that ends up in the fountain! Every night about 3,000 Euros are swept up from the bottom of the basin. The money is donated to Caritas, a catholic charity, who uses the money to provide services for needy families in Rome. Some of the money is used to subsidize a low cost supermarket. Italian fashion company Fendi, announced in January 2013 that it would fund a 2.2 millon Euro restoration of Trevi Fountain. The 17 month project wrapped up in late 2015 and was the most thorough restoration in the fountain’s history. The facade and statues were cleaned, the gilded Latin inscriptions replaced, new pumps were installed and the basin waterproofed. Visit once during the day and then again at night. I only visited during the day, but from pictures I’ve seen the fountain looks spectacular at night. Crowds are hard to avoid, but your best bet to getting a nice photograph without a ton of people in it is to visit just after sunrise. Watch your belongings. People will be brushing up against each other trying to get close to the fountain and being alert will make sure no one walks off with your valuables. For quick and convenient access to Rome’s attractions, here is a trusted vendor where you can buy advance, mobile tickets to many of Rome’s best sites and activities. Digital ticket delivery is instant and you can show your phone (in most cases) at the ticket holders entrance- no need to print your tickets. For your convenience, here is a list of hotels in Rome. Please consider booking your Rome accommodations through the included link. It costs you nothing extra and helps support this website. Thank you!